In previous part I told about some performance enhancements which could be used with ServiceStack running over mono XSP web server. 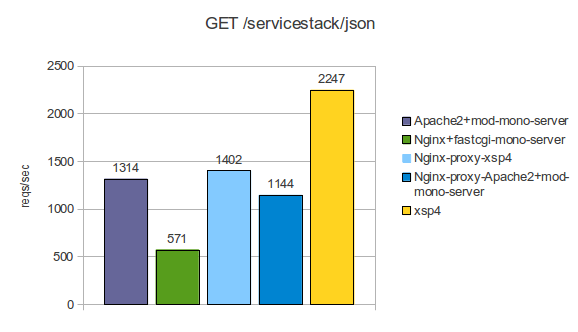 But nobody uses XSP in production environment, the most common use cases are nginx+mono-fastcgi and apache+mod_mono. But what is the performance in such environment? Will see it. 1. Direct access to static html file from apache without mono. 3. Get static html file and "Hello, World!" aspx page throught apache2-mod-mono without ServiceStack. 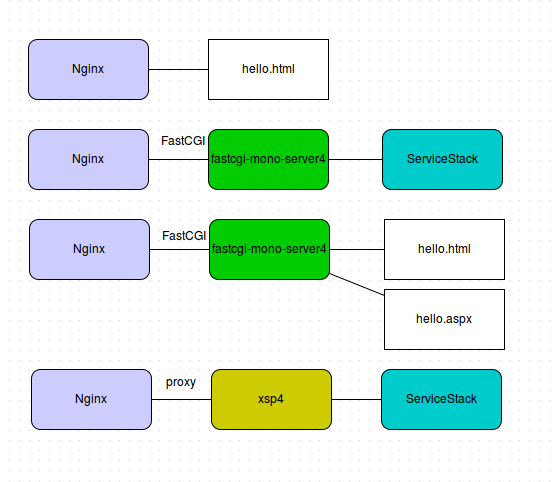 Configuration of Nginx is similar to Apache, differences are only in transport between mono and front-end web server. 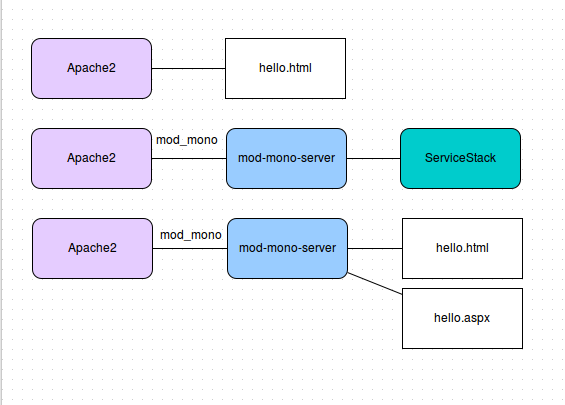 Apache uses mod-mono-server while nginx uses fastcgi-mono-server. Also, you may note that I added one additional configuration: nginx as proxy to xsp4. Nginx as frontend proxy to self-hosted ServiceStack. What can we see? First place in serving ServiceStack takes xsp4. 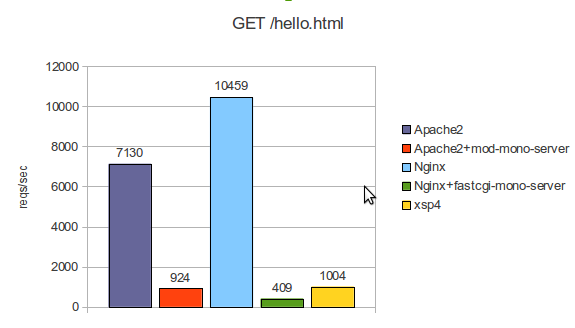 Then goes Apache+mod_mono and the last one is Nginx+fastcgi-server which is four times worse then the winner. I did not mentioned here Nginx+proxy xsp4 configuration because during test execution in half of test runs I get errors when receive json data. There were not so many errors (~1500 on 100 000 requests), but they were exist and this was the reason to drop away nginx+xsp4 configuration from competition. By the way performance result for the configuration slightly better than apache+mod_mono and much better than Nginx+fastgi-server. 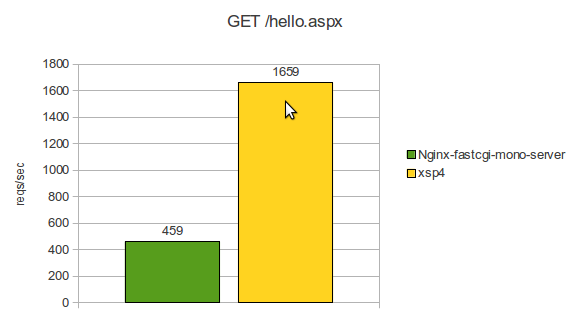 As serving static html files the first place takes Nginx as expected, second by Apache and after them goes all other configuration: xsp4 (you can see test results for static xsp4 html serving in previous post), Apache+mod_mono, Nginx+fastcgi. They all are really very slow comparing with Nginx or Apache. For .aspx page I could not get reliable results. At first, there are memory leaks in mono web server during processing the aspx pages and they are possible a reason of crashes I've got. I could only get ~20000 requests with Nginx+fastcgi and several thouthands request with Apache+mod_mono before mono hanged or got SIGSEGV. I suspect that the reason of these faults are changes of hadling and spawning threads and changes performed in mono GC. Hope that this instablity will be fixed in next mono release.